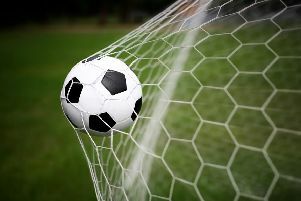 An extra-time penalty from young Kian Moynes gave Hollington United Football Club’s first team a cup victory on Saturday. The Lions prevailed 3-2 after extra-time at home to Burgess Hill Albion in round one of the Mid Sussex League’s Senior Charity Cup. The third meeting between the teams already this season (the league matches produced a win each) wasn’t the greatest spectacle with both sides guilty of sloppy play. That said, a bit of magic opened the scoring as Sam White fired into Burgess Hill’s top corner from 25 yards. It soon became 2-0 when Alan Foster turned in Sean Ray’s header from a corner, but Burgess Hill halved their deficit right on half time with a cracking goal of their own. The second period started very much like the first and the Lions got punished for a lack of concentration as Burgess Hill equalised straight from a corner. This finally got Hollington awake and from then on they completely dominated the game only to find the visiting goalkeeper in fine form. Sixteen-year-old debutant Tom Chalmers was denied twice with from headers, and Dominic Clarke and Ray also came close. The match would go into extra-time and again it was the Lions who pressed for the winner. They were finally rewarded for their continuous pressure when Moynes produced a bit of magic to win a penalty. With regular spot-kick taker Glenn Woodhurst still missing with a broken rib, Moynes himself grabbed the ball and smashed it into the bottom corner with his family unable to watch. Man of the match, sponsored by Hydro Heating Services, was Ray, who probably doesn’t get the praise he deserves and was again immense at the back. Hollington: Stokes, Fitchett, Ray, Corrigan, Woodley (Kearley), Martin, Bailey (Chalmers), Foster, Moynes, White (Southwood), Clarke. Hollington will return to league action this coming Saturday with a top-of-the-table clash at home to Balcombe. Kick-off at Gibbons Field is 2pm.